MX Vertical is an advanced ergonomic mouse that combines science-driven design with the elevated performance of Logitech's MX series. MX Vertical's natural handshake position reduces muscular strain by 10 percent and promotes a more ergonomic posture. MX Vertical's unique 57° vertical angle reduces the pressure on your wrist, while your thumb is positioned comfortably on the thumb rest. MX Vertical has been designed and tested with criteria set out by leading ergonomists - improving posture, lowering muscle strain, and reducing wrist pressure. Advanced optical tracking with a dedicated cursor speed switch results in 4x less hand movement - reducing muscle and hand fatigue. 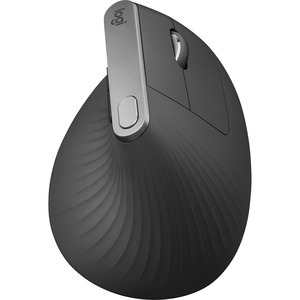 Logitech's MX mice are engineered for masters of their craft who want to get more done, more efficiently.